I love this watch - typically I don't wear watches, but I just purchased this and have gotten so many compliments. The quality is exceptional - looks very high end. I can wear it with jeans or going out for the evening - very versatile. 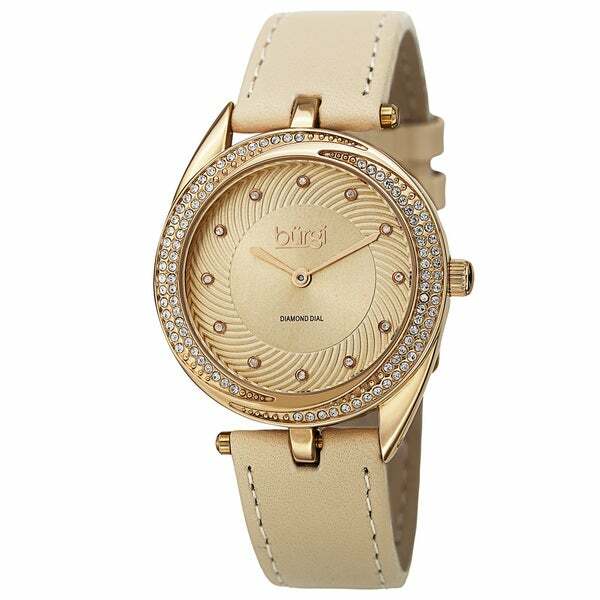 This Burgi women's watch has a genuine leather strap and a fascinating case design. It features sparkling diamond markers and sleek hands on the dial. The crystal swirl on the bezel gives this dressy and stylish timepiece a glamorous effect. This watch is more beautiful in person. I was afraid of it being to much for everyday wear. But, once I got it I realized it's simple elegance. I wear with jeans to dress clothes. Love this watch.